How to compare the differences between two PDF files on Windows? 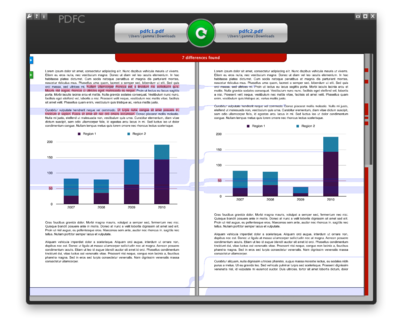 Do you know a good way to compare PDF files side-by-side and show the modifications between the two? I'm looking for Windows software to accomplish this. It would be great if you can post both free and not-free products. Try WinMerge with the xdocdiff plugin. Both are completely free. No strings attached. Then when comparing, you'll see what look like text files in the comparison windows. On Linux and Windows you can use diffpdf (which differs from diff-pdf mentioned in this thread). See further this UbuntuGeek page on comparing pds textually or visually. For Windows, this Diffpdf Windows version works really great. You can download from http://soft.rubypdf.com/software/diffpdf (scroll down to Win32 static version). I recently found this and I love it. Cross platform, free, and works well. We also needed to compare PDFs at our company and were not satisfied with any of the solutions we found, so we made our own: i-net PDFC. It's not free, but we do offer a 30-day trial. It's written in Java, so it's cross-platform. What makes it special is that it compares the content as opposed to only the text (or just converting the pdf to an image and comparing the image). It also has a nice visual comparison tool. You can also use Adobe Acrobat X. Its has built in PDF comparison functionality under "View -> Compare Documents. ignore whitespace, line breaks, page breaks, etc. easily see when just a couple words that changed, not just entire lines/paragraphs. Now I can see which words, nicely colored, have changed. Using dwdiff can produce slightly better results. I also wanted HTML output so this tiny script makes a basic web page with a bit of CSS. Then open q.html with your web browser. 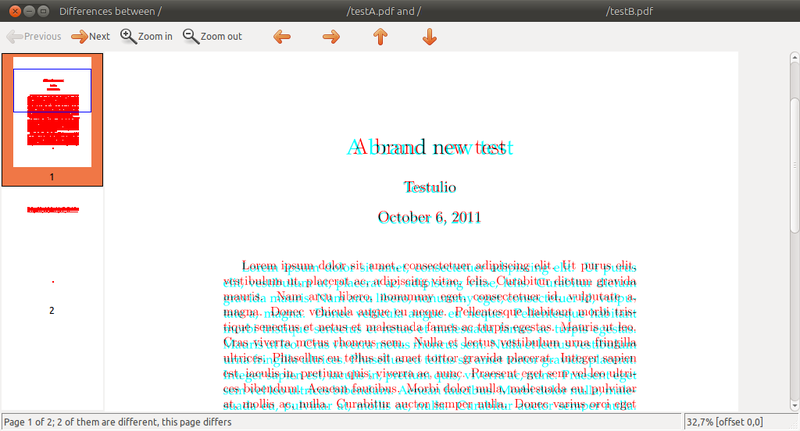 If you are comparing text inside a pdf, then Beyond Compare does this. Not free, but there is a thirty day trial. Compares many different kind of files. It has some built-in converters, including one for PDF files. I've used it quite a few times with satisfying results. Really should try this. Trial version allows comparison for unlimited time. I open both documents up and have them split screen against each other. Not the most practical solution, but it works! I have not seen a good DIFF package for PDF files and whilst manual and annoying, my way works! Here you can upload two pdf's and get back the third one which will display to you the difference between the two. Works on all platforms, theres nothing learn or install and its free. Convert both PDFs to Microsoft Word documents using one of the websites that do this for free. Use the document comparison functionality in Word. Depending on how complex the formatting in the PDFs is and the kind of changes you're looking for, this might be OK. Compare a revised PDF to an earlier version. If you decide on Acrobat, the comments on this page are pertinent to its use. Diff Doc - not free. For a very primitive form of synchronized scrolling between two pdf files, you can use the following autohotkey script I wrote. It assumes you have two SumatraPDF windows open. Press right to go to the next page in both windows, press left for the previous page. 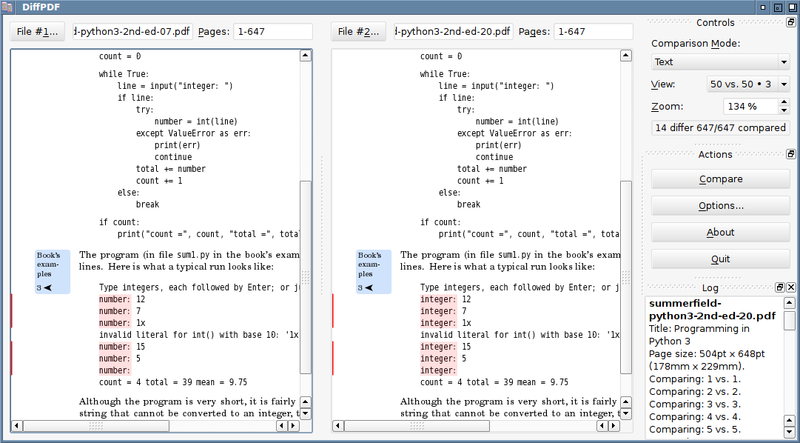 pdf-diff is a Python package for this purpose. There is also free online https://www.diffchecker.com/diff. But it highlights only text differences without images and formatting. And it's too weak in matching unchanged fragments in large files. Not the answer you're looking for? Browse other questions tagged windows pdf file-comparison or ask your own question. How to compare the contents of two PDF files? Tool for performing a PDF Diff? How can I find the differences in visually identical PDF files? Any software to compare text in PDF for various languages? 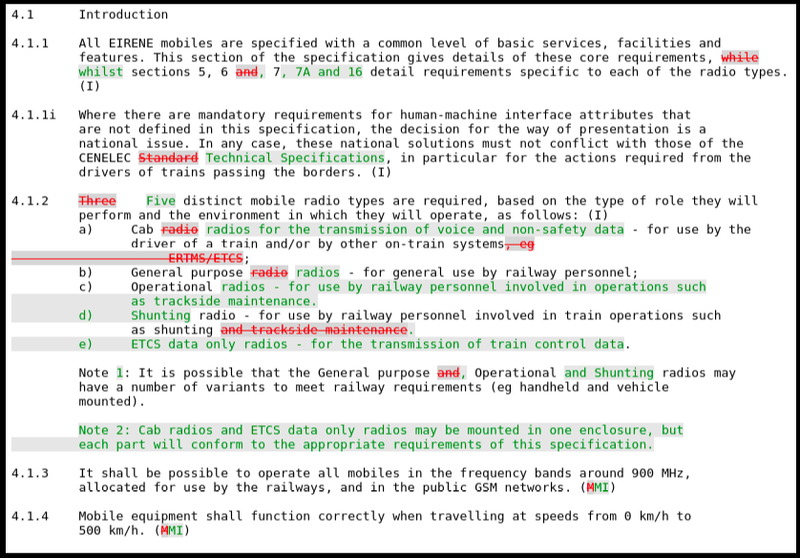 How can I see two different pdf documents on screen split vertically? How to compare multiple (thousands) of PDFs? What's a good way for organizing PDF documents on Windows? Combine two separate 8.5 x 11 PDF documents into one 11 x 17 PDF document? How to make notes of pdf files having around 500 pages?